A healthy lady of 42 years underwent deep anterior lamellar keratoplasty for granular dystrophy. The very next day, it was complicated by development of infectious keratitis. The organism was identified as multidrug resistant Klebsiella pneumoniae. Donor corneal button may be implicated in the transmission of infection in an otherwise uneventful surgery and follow-up. Nosocomial infections are usually severe, rapidly progressive and difficult to treat. Finally, the lady had to undergo therapeutic penetrating keratoplasty for complete resolution of infection. Multidrug resistant Klebsiella is the emerging group of bacteria, which is the leading cause of nosocomial infection. Donor cornea may acquire the organism from hospital environment. Timely recognition and prompt treatment is mandatory to prevent devastating complications. Herein we report a case of acute postoperative infection after keratoplasty, which is likely due to donor cornea contaminated with hospital acquired organism. A 42-year-old lady with granular dystrophy underwent DALK in the left eye with big bubble technique. At first 8 mm of recipient stromal flap was partially dissected from the surface, then air was injected into the substance of the remaining stroma. This would enable air to pass in the plane between the descemet membrane (DM) and the deepest stroma so that the stroma can easily be separated from the DM, leaving bare DM. The donor button was cut 8.25 mm; its DM was peeled off and was placed over the recipient DM and sutured with recipient rim. Age of donor cornea was 36 years and it was in situ cornea excision. The surgery had gone quite well, but to our alarm, on the first postoperative day (POD), there was whitish infiltrates along the graft-host junction almost 180° with severe anterior chamber reaction. It was postoperative keratitis. On the same day, the graft was removed and replaced by another stromal graft. 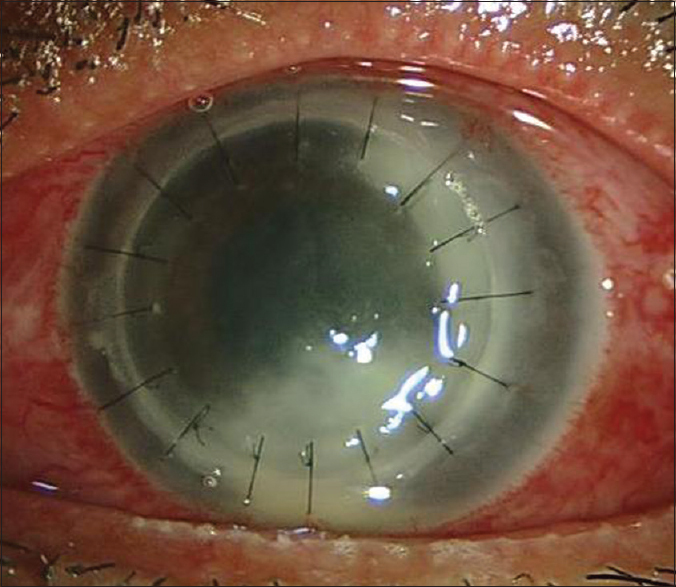 The removed graft and the corneal scrapings from recipient rim were sent for microbiology. Because the host DM was clear and intact, we preferred not to convert the procedure into PK, although there was thin line of residual infiltrates in the host rim. Three hours after the surgery topical vancomycin (50 mg/ml) and ceftazidime (100 mg/ml) were started hourly during day and two hourly at night. Gram-stain showed presence of Gram-negative Bacilli. On the next day of repeat-deep anterior lamellar keratoplasty (reDALK), the clinical picture was even worse with infiltrates along the entire graft host junction and hypopyon [Figure 1]. Topical antibiotics were increased to half hourly. Report of the corneal scrapings and corneal button, both revealed Klebsiella pneumoniae resistant to cefazolin, amikacin, vancomycin, ceftazidime, ofloxacin, ciprofloxacin, moxifloxacin, cefixime, chloramphenicol, tetracycline, gentamicin, and cefalexin. It was sensitive to imipenem, tigecycline, and partially sensitive to gatifloxacin. Imipenem (5 mg/ml) drops was started hourly during day and two hourly at night. Despite this, the infiltration extended toward center of graft and hypopyon persisted [Figure 2]. Four days later, large diameter (9.5 mm donor, 9 mm recipient) therapeutic penetrating keratoplasty (TPK) was carried out during which infiltrates were observed also in host DM, which was not there during reDALK. The next day, the graft was clear without infiltrates or hypopyon. Imipenem was continued. Gatifloxacin drops was added every half hourly. Gatifloxacin is not locally marketed and it took us some time in its procurement. Five days later, prednisolone drops 1% 4 times a day was added. At 6 weeks, unaided vision was 6/60 improving to 6/18 with pin hole. Her graft was clear, anterior segment was quiet with normal intraocular pressure and eradication of the pathogen [Figure 3]. Postoperative keratitis after PK varies from 1.46% to 11.9%. Sharma et al. 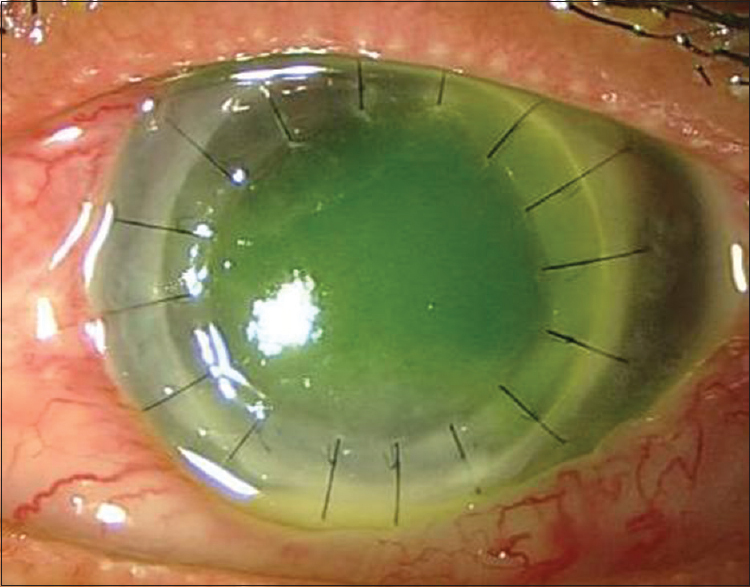 reported 11% incidence of postoperative keratitis after anterior lamellar keratoplasty; in two cases, TPK had to be done and the most common organism was Staphylococcus. Epithelial defect, suture abscess, vernal keratoconjunctivitis, recurrent herpetic keratitis were the predisposing factors. , In our case, keratitis was seen right on the first POD. Hence, either intraoperative field or donor cornea may be implicated in the infection. Egrilmez et al. reported a similar case of keratitis after DALK with multidrug resistant K. pneumonia, which completely resolved with sensitive antibiotic, imipenem 5 mg/ml  whereas our patient did not. In reDALK, we had left some residual infiltrates, as we had not known about the multidrug resistant organism and because, the DM was clear, we hesitated to do PK. Zarei-Ghanavati et al. also reported keratitis by K. pneumoniae in second POD of DALK. They had done culture of corneoscleral rim, which showed Klebsiella the sensitivity pattern of which matched with the isolate from the transplanted graft. Although, literatures show that donor corneoscleral rim culture report lacks predictability about postoperative infections, , the donor cornea could be the reason for contamination in their case. In eye bank from where we obtained donor cornea, corneoscleral culture is not routinely done. Nor was it done at the time of surgery. So we lack information on this. Antonios et al. showed a statistically significant increase in contamination of donor rims with preservation time of more than 5 days. In our case, recovery time was 6 hours after death and preservation time in McCarey Kaufman (MK) media was 72 hours. Multidrug resistant Gram-negative Klebsiella is emerging group of organisms causing nosocomial infection. Risk factors for nosocomial infection include advanced age, prolonged illness, treatment with many antibiotics, mechanical ventilation, and long hospital stays. This could be the explanation for donor contamination in the case report by Egrilmez et al. in which the donor was under long-term intensive care. In our case, the recipient was healthy and so was the donor, who died at the age of 36 years due to fall from height; death was declared on reaching the emergency of the donor hospital. Nevertheless we cannot deny acquisition of the organism from this hospital because in a recent study, Tada et al. had isolated multidrug resistant K. pneumoniae from samples (pus and sputa) of 25 in patients of this hospital. In this report, all the isolates were resistant to piperacillin, ceftazidime, cefotaxime, cefepime, aztreonam, 17 were resistant to imipenem and meropenem, 20 were resistant to all aminoglycosides tested, and 22 were resistant to ciprofloxacin. However, the fellow donor cornea, with the same preservation media when was transplanted to another recipient on the same operating table, on the same day, had uneventful postoperative period. Air microbiology of operation theatre taken on the second POD of DALK, revealed Staphylococcus, Micrococcus and occasionally Gram-positive Bacilli within acceptable range. Swabs taken from microscope, operating tables and chairs also gave similar results, whereas those from autoclaved surgical instruments and gowns were sterile. Considering all the factors, donor hospital acquired contamination of the corneal tissue is the most likely explanation. Donor person high risk for nosocomial infection should be a relative contraindication for cornea recovery because of severe nature of hospital acquired infection. Even if donor rim cultures are not done routinely, one could keep the residual donor rim for a few days in the MK medium instead of discarding the rim on the day of surgery, and this can be subsequently cultured in case of postoperative sepsis. Vajpayee RB, Sharma N, Sinha R, Agarwal T, Singhvi A. 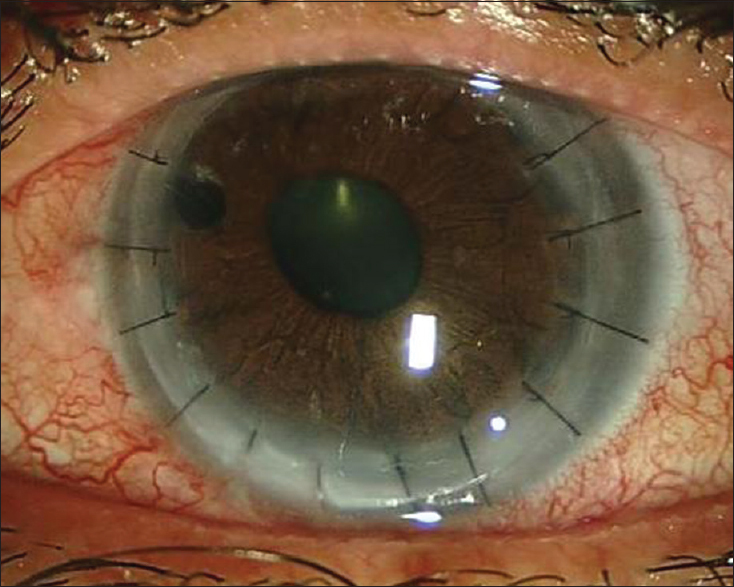 Infectious keratitis following keratoplasty. Surv Ophthalmol 2007;52:1-12. Arnold RS, Thom KA, Sharma S, Phillips M, Kristie Johnson J, Morgan DJ. Emergence of Klebsiella pneumoniae carbapenemase-producing bacteria. South Med J 2011;104:40-5. Sharma N, Gupta V, Vanathi M, Agarwal T, Vajpayee RB, Satpathy G. Microbial keratitis following lamellar keratoplasty. Cornea 2004;23:472-8. Egrilmez S, Palamar M, Sipahi OR, Yagci A. Extended spectrum beta-lactamase producing Klebsiella pneumoniae-related keratitis. J Chemother 2013;25:123-5. Zarei-Ghanavati S, Sedaghat MR, Ghavami-Shahri A. Acute Klebsiella pneumoniae interface keratitis after deep anterior lamellar keratoplasty. Jpn J Ophthalmol 2011;55:74-6. Rehany U, Balut G, Lefler E, Rumelt S. The prevalence and risk factors for donor corneal button contamination and its association with ocular infection after transplantation. Cornea 2004;23:649-54. Tada T, Miyoshi-Akiyama T, Dahal RK, Mishra SK, Ohara H, Shimada K, et al. Dissemination of multidrug-resistant Klebsiella pneumoniae clinical isolates with various combinations of carbapenemases (NDM-1 and OXA-72) and 16S rRNA methylases (ArmA, RmtC and RmtF) in Nepal. Int J Antimicrob Agents 2013;42:372-4.